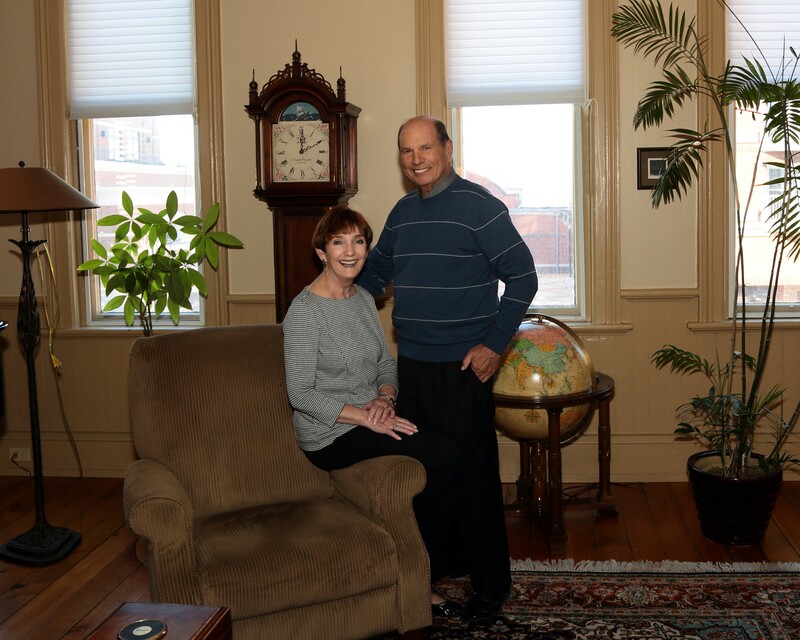 Ben and Judy first came to the area from Indiana in 1971 when Ben took a job as a trust officer for the former Zeeland State Bank. “We didn’t know anything about Holland/Zeeland. There was snow during Tulip Time that year, and there we were watching our first Tulip Time parade, bundled up in mittens, hats, and coats,” recalled Judy. Despite that first cold Tulip Time, they fell in love with the area and have been here ever since. One of the first things Judy got involved in was Hospice of Holland when it was initially getting started. Years later, she found herself being asked to join the Community Foundation board. Ben had a long career in the banking and investment industry. He chaired the Holland Board of Public Works for many years. As a long time flying enthusiast, Ben, as a board member and pilot, was actively involved in the purchase and development of the Tulip City Airport. Judy’s been involved in countless other community efforts, especially within the arts. These include co-founding the Waterfront Film Festival, volunteer roles with the Holland Museum and Herrick District Library millage efforts, and advising the Saugatuck Center for the Arts and the Holland Area Arts Council. To ensure that their support of the arts continues beyond their lifetimes, they established the Ben and Judy Smith Fund for the Arts, a Field of Interest Fund that’s part of our Community’s Endowment. Judy was an early believer in the importance of our Community’s Endowment and a key leader in the launch of our “Today. Tomorrow. Forever.” campaign. “We knew we needed to grow our Community’s Endowment. We truly believe in it. We see it as our community’s savings account. We believe people should invest in it and enjoy that you can focus on an area of personal passion. Ours is the arts. With a field of interest fund, we’re able to narrow our focus while also trusting the Foundation with where the dollars should go,” said Judy. One of Judy’s favorite parts of her nine-year board service was being a member of the Foundation’s distribution committee. “Witnessing that depth of knowledge and expertise made me realize how much work goes into vetting and understanding the local nonprofit projects that receive grant funding. It also made me realize how many more needs and opportunities we could respond to in the future if we can grow the Community’s Endowment. We want to build this fund to a significant amount that will meaningfully support the arts along the lakeshore for a very long time,” said Judy. “This community has been very good to us, so we hope in some small way we can provide support to allow the area to continue to thrive,” said Ben. Originally featured in the Community Foundation’s 2016 Annual Report. While this was written by CFHZ’s Communications Manager Nicole Paquette in 2017, we believe that stories of generosity are timeless and always relevant.